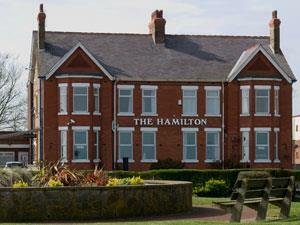 The Hamilton01493 844662work01493 745772fax Guest HouseThe Hamilton is open all year round and is ideally situated on the seafront overlooking the beach and Ventian Waterways. The Hamilton offers a warm welcome with excellent hospitality for guests looking for that special break or equally for business clients visiting the area. Free WiFi available. The Hamilton is just a pleasant stroll to all the shows, tourist attractions and the shopping centre. We offer a relaxed family run environment and our personal attention ensures everyone has a most enjoyable stay. We are located to the north of the town and conveniently situated close to the greyhound and horse racing courses. The Hamilton is open all year round and is ideally situated on the seafront overlooking the beach and Ventian Waterways. The Hamilton offers a warm welcome with excellent hospitality for guests looking for that special break or equally for business clients visiting the area. Free WiFi available. As well as a high standard of service and a friendly atmosphere The Hamilton provides excellent standards of cleanliness, thus ensuring people return time and time again. Bar Children welcome from any age. Follow A47 into Great Yarmouth. Follow signs for seafront. At seafront turn left and we're 800 yards on the left. Our post code is NR30 4EW for those of you with Sat Nav or if using a route planner. From Great Yarmouth Train Station you would be advised to call a taxi - Albies 01493 331111.